In his short career, Michael McDowell made his mark with some darkly comic celebrations of the macabre: most famous as the screenwriter of Tim Burton’s BEETLEJUICE and the Burton-produced THE NIGHTMARE BEFORE CHRISTMAS, he was also a gifted writer of novels and short stories – not to mention a noted collector of death memorabilia. McDowell died in 1999, but an unlikely filmmaker (Griff Furst, hitherto boasting a filmography of Asylum monster movies like ARACHNOQUAKE and SWAMP SHARK) has crafted an evocative adaptation of his 1980 novel “Cold Moon Over Babylon”. Set in Babylon, Florida in 1989, it opens strong, with an atmospheric bridge-set murder scene: the murdered 16 year old girl is the granddaughter of a widow (Candy Clark) facing the prospect of losing her family farm. Sheriff Frank Whaley and prominent suspect Josh Stewart are among the townsfolk forced to face dark secrets and paranormal phenomenon. 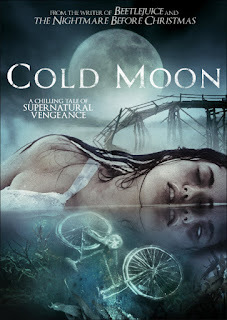 A beguiling murder mystery that takes a sharp turn into increasingly surreal supernatural territory, COLD MOON surprises with its mid-point reveal and, as you would expect from a McDowell-inspired concept, delivers a series of strikingly macabre images. The final half hour unleashes more overtly bizarre mayhem, but this effectively eerie and visually inventive picture has a particularly haunting tableau early on, of the dead teenager - her violated corpse bound to her own bicycle underwater. The cast are excellent, with Whaley underplaying nicely and another fine character turn from Christopher Lloyd as his paraplegic father.